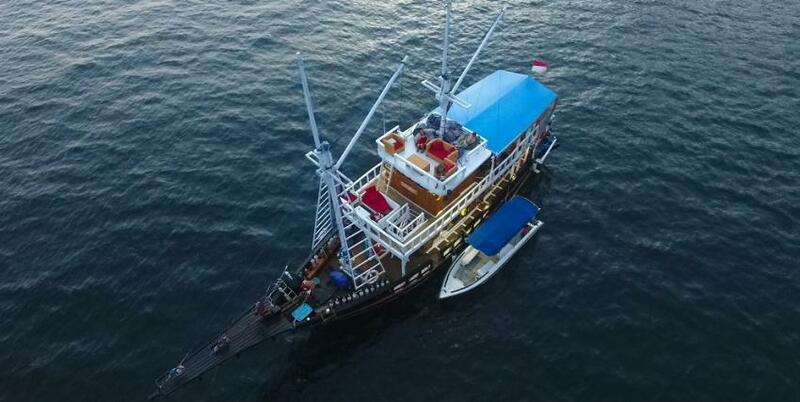 Ratu Laut is a modern liveaboard made in traditional style. The yacht offers amazing diving safari in Indonesia at an affordable price. Ratu Laut is a small boat. There are only 4 cabins on board. She is perfect for traveling with family or friends. All cabin has individually controlled air-conditioning. There are 2 quad room and 2 rooms with twin beds bunk style. In between dives passengers of Ratu Laut can spend time in a cozy living room. It’s perfect to relax, chat with other passengers on board, try some delicious food. There is also an open part on the top deck, great to enjoy the gorgeous view. Dive deck of Ruta Lautt equipped with all necessary equipment. Gear items can be rented on board. The experienced diving team can help you to prepare your equipment for the dive. There is all safety facilities on board of Ruta Laut: emergency rafts, life vests, first aid kit, oxygen. Boat’s crew trained to manage emergency situations. Ratu Laut itinerary dedicated to exploring of Raja Ampat. This amazing destination is a true paradise for divers. It holds the world’s record for the biggest amount of fish and corals species could be met during the dive. Turtles and mantas can be seen while diving here as well as schools of trevallies and tuna. Such rare creatures as wobbegongs can be spotted in Raja Ampat. Raja Ampat is great for diving with sharks. Divers can see a great amount of soft and hard corals, dive between anemones, sponges. October until the end of April is the best time to dive at Raja Ampat. April is great to dive with mantas. Strong winds that begin in July and lasts till September causes strong currents. Just finished my second Raja Ampat trip with Mikumba. This trip also southward to Misool area. Unbelievable!!! Again we had a great group of fun people! On the superluxurious liveaboards you often find a different type of personalities...if I may put this nicely:) On Mikumba's ship Ratu Laut there is everthing you need. Cosy cabins with a/c...warm showers...great food(Thanks again chef). Staff knows exactly where to take you diving. The are very experienced. Thanks to Big Boss Fred, UK Max, boyband Hugo, Hery (best capt ever), funny curly Erik...the rest of the crew and especially dive guide Fareez. Can't wait to join again next year on Mikumba's new ship!